Thanksgiving is a special time of year. It makes us reflect back on our lives and honors those people who are in our lives and say thanks for being a part of it. Regardless if they’re blood-related or not, there’s always someone to be thankful for. Sometimes, all we have are friends and they’re just as much a part of your family as your blood relatives which is why Friendsgiving, aka Friend Thanksgiving, has become a trend. Show the people in your life how much you’re thankful, grateful, and blessed to have them a part of your life. 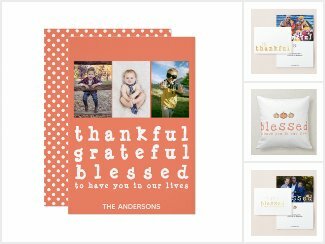 We’ve got custom foil greeting cards, photo cards, stamps, return address labels, stickers, fleece blankets, pillows, paper napkins, paper plates, and so much more to help you express your gratitude. **Some links on this post are affiliate links, meaning, at no additional cost to you, we may earn a commission if you click through and make a purchase. However, any referrals we suggest are because we either use or trust the product/company completely.